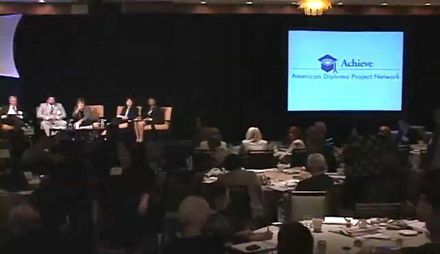 The goal of the annual American Diploma Project (ADP) Network Leadership Team Meeting was to provide states with a forum to address key challenges and opportunities associated with advancing and sustaining the college- and career-ready policy agenda. Participants had time to engage with national experts, learn from colleagues in other states, and meet in state teams to plan next steps in their ongoing efforts to advance the ADP policy goals. Each state's team was comprised of key stakeholders in the K-12 and higher education sectors, including the K-12 chief state school officer, the governor’s education advisor, the state higher education executive officer or other ranking official from the postsecondary community, a representative from the business community, and a state legislator or state education board member. Some of the topics discussed included Common Core State Standards implementation, strategies for aligning the college readiness and college completion agendas, and STEM education. The annual meetings took place each September. See the Additional Resources links for resources by year.